After sending a letter to the Environmental Protection Agency (EPA) on May 27 asking that the proposed Gogebic Taconite mine be stopped, six Lake Superior tribes will meet with the agency on August 16th in Grand Traverse, Michigan to discuss their concerns with the northern Wisconsin mining project. 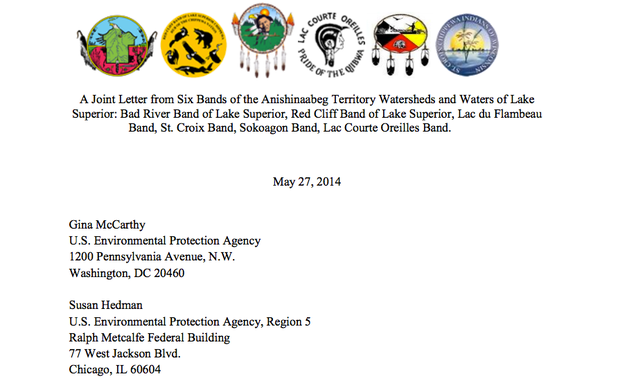 The letter was sent by the Bad River Band of Lake Superior, Red Cliff Band of Lake Superior, Lac du Flambeau Band, St. Croix Band, Sokoagon Band, and the Lac Courte Oreilles Band, asking the EPA to enact Section 404(c) of the Clean Water Act to "protect treaty rights, aquatic resources, fisheries, wildlife, subsistence and public uses in the Bad River Watershed and western Lake Superior Basin from metallic mining, including a potential Gogebic Taconite mine." Section 404(c) of the Clean Water Act allows the EPA to "prohibit, restrict, or deny the discharge of dredged or fill material" at a site if it is determined that there would be negative environmental impacts on various resources. Using this administrative rule, the EPA reviewed and has now proposed restrictions on mining activity at Pebble Mine in southwest Alaska's Bristol Bay watershed. The letter calling on the EPA to stop the proposed GTAC mine was sent at the same time that three of the six Lake Superior tribes' wastewater treatment plants were in violation of the Clean Water Act themselves. One tribe, the Bad River Band, has had more violations of the Clean Water Act than any other wastewater treatment facility in the state of Wisconsin. GTAC spokesman Bob Seitz told MacIver that they "continue to gather the data to allow state and federal experts to determine, based on scientific fact, whether this mine can be developed without harming the water or air." Bad River Tribal Chairman Mike Wiggins told Wisconsin Public Radio (WPR) that he felt Bad River was facing the greatest threat from the mine, and that some federal involvement would be needed to protect tribal lands. Seitz went on to say that GTAC doesn't "know why anyone would want to prevent gathering the scientific data needed to make an informed decision, unless they fear we are right and this mine and these jobs can be created safely." MacIver contacted the EPA for further explanation of the meeting and its goals but an EPA representative did not return our request.